Are you sick of always just throwing some BBQ sauce on your chicken and slapping it on the grill? If you are interested in trying something different with a little less bold flavor, this recipe is a simple alternative that is just as easy to cook. Instead of BBQ sauce, all you need to do is buy some Italian salad dressing and some Italian seasoning. These are two ingredients that most people already have in their kitchen. Either cut little slices in your chicken breasts or poke holes all along the outside with a fork. This will help your seasoning and Italian dressing seep into the center of the chicken and help increase the flavor and juiciness. Put your chicken breasts, Italian dressing, and Italian seasoning in a bowl or large gallon zip lock bag. Allow your chicken breasts to sit in this mixture for at least 2 hours or as long as 12 hours before you put them on the grill. The longer you leave the chicken in the marinade the more flavorful your chicken will become. Place your chicken breasts on the grill and drizzle some of the remaining marinade over the top of the breasts. Flip over your chicken breasts after about 8 minutes. 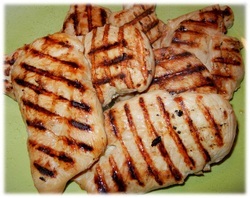 Your Italian grilled chicken will take about 15-20 minutes total, depending on the thickness of your chicken breasts.